Burj Al-Luqluq Social Center Society and Al-Meethaq for Human Rights Organization launched “Jerusalemite Rights” initiative on Wednesday 14\10\2015. This initiative aimed to aware the Jerusalemite youth about their rights in case of personal and body inspection, in addition to inspecting cars and homes. The brochure contained a number of legal instructions that helps citizens deal with the practices of the occupation authority with Palestinians living in Jerusalem. Al-Meethaq for Human Rights Manager, Firas Al-Sabbah assured that the aim of this initiative is to aware the Jerusalemite youth about their basic rights, especially under the huge attacks they have been going through since the beginning of October2015. On his behalf, Burj Al-Luqluq Executive Manager, Muntaser Edkaidek assured that the center will continue to publish awareness brochures about the laws and procedures of the occupation. 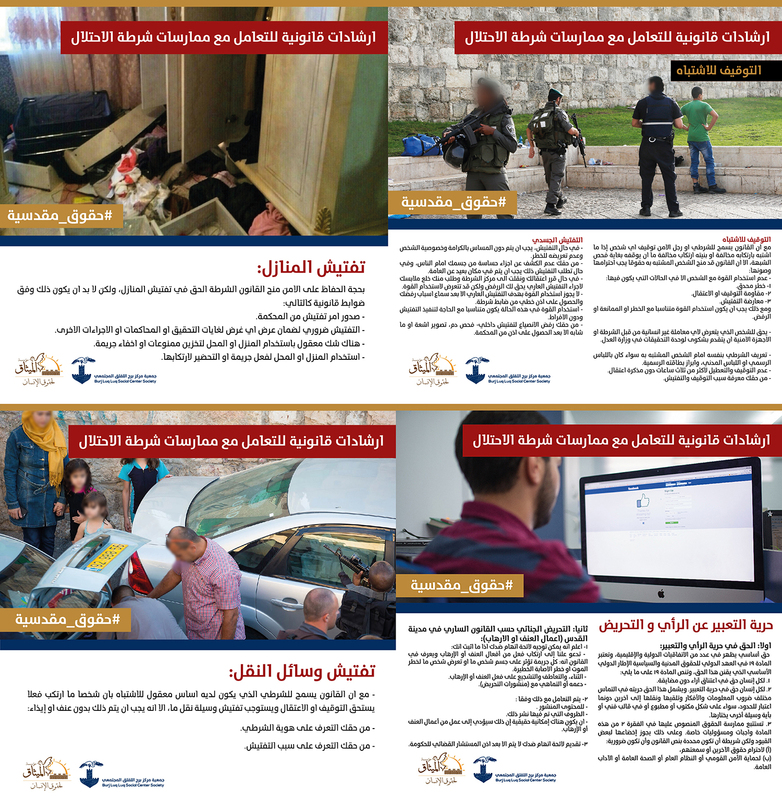 These brochures will educate Jerusalemite youth and teach them about their rights. He added that the next brochure will be how to use the social media in a safer way, as the occupation authority tends to track what Palestinians post and share which might lead them to end up in jails.